The Lake Michigan Shore Wine Trail is pleased to announce a new elected position in the leadership roles. Beginning January 2018 Melanie Owen will be the first ever Vice President. This new leadership position, is an elected positions with a term of two year. Upon completion of the two year term the VP will automatically become President. The role of the Vice President will be to chair the advertising and marketing committee and to preside over meetings, if the President is unable to attend. Melanie Owen is co-owner of Lazy Ballerina Winery, located in St. Joseph, Michigan. Left Foot Charley Winery in Traverse City, Michigan has been awarded another nationally acclaimed Jefferson Cup Award for its 2016 Eden Hill Vineyard Blaufränkisch. The two day long 18th Annual Jefferson Cup Invitational was held November 16th and 17th in Kansas City, MO. The Jefferson Cup is an invitational competition for select wineries throughout America that exemplify viticulture and winemaking. The Jefferson Cup Invitational was founded in 1999 in honor of Thomas Jefferson. Jefferson fathered our constitution, helped champion the international concept of human rights and was a seminal figure in America’s cultural, culinary (including wine) and agricultural history. In early September, the ownership and management of Hickory Creek Winery in Baroda Township officially changed hands from previous owners Eric and Jayne Wagner to Adam McBride of Grand Rapids, Michigan. Hickory Creek is featured on the Lake Michigan Shore Wine Trail and sits on a picturesque 38-acre farm and vineyard in Southwest Michigan. October 26, 2017 (Lansing, Mich) — The Michigan Grape & Wine Industry Council has published the results of an economic impact study confirming what members of the industry have long suspected – the growing industry is a substantial contributor to the state’s economy. A statewide impact study and survey conducted by John Dunham & Associates revealed that Michigan’s wine industry is responsible for more than $5.4 billion in economic impact, including more than $426 million paid in state and local taxes. The Michigan wine industry directly creates nearly 28,000 jobs and pays $773 million in direct wages. Lansing, MI - A unique partnership between the Michigan Grape and Wine Industry Council and Michigan Department of Natural Resources encourages visitors to plan a Michigan Wine, Camp & Trail Adventure by pairing Michigan agriculture and outdoor recreation. Michigan is home to 130 wineries, 103 state parks, 12,500 miles of designated state trails, 138 state forest campgrounds and unlimited places of natural beauty. Lansing, MI ­- Michigan Wine Month will take place during May following a decision by Michigan’s Grape and Wine Industry Council during their regular meeting on December 1, 2016. The change from April to May will take effect in spring of 2017. 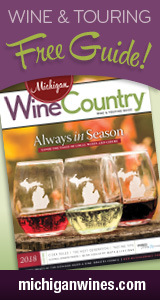 May kicks off a season of travel in Michigan, and the majority of wineries expand their hours to accommodate increased tourism. Warmer weather in May also makes it more desirable for travelers starting to plan their summertime wine touring. With an eye toward refinement and continuous improvement of its award winning wines, Round Barn Winery is delighted to announce that it has hired Brian Carlson as their new Winemaker. Carlson comes to Round Barn from Walla Walla, Washington with a Fermentation Science Degree from the U.C. Davis and has worked for the past 25 years with wineries in California, Oregon and Washington.